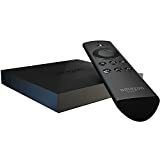 amazon has the amazon Fire TV for $99 with free shipping. Sells for $99+ Highest Price. Deals for $99 Lowest Price. Normally $99+. amazon Fire TV is a tiny box you connect to your HDTV. It's the easiest way to enjoy over 250,000 TV episodes and movies on Netflix, amazon Instant Video, and HBO GO, plus games, music, and more.